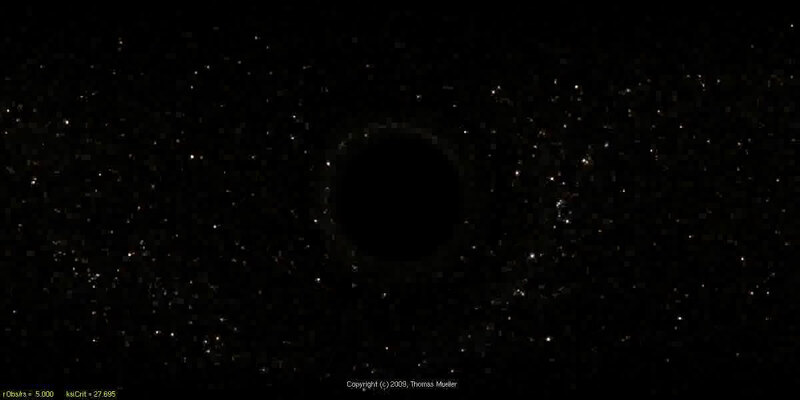 (PhysOrg.com) -- Black holes are my constant companions, at least in my imagination. Starting back a couple of decades ago, two sets of basketball tickets disappeared into one of them, and since then a pair of ski gloves, a gold ring, and more CD’s than I can count were sucked out of my hands in the same way. Not too many of us have actually seen a black hole, but Thomas Müller, physics student, and Daniel Weiskopf, computer science professor, at the University of Stuttgart, have programmed a vision for us. 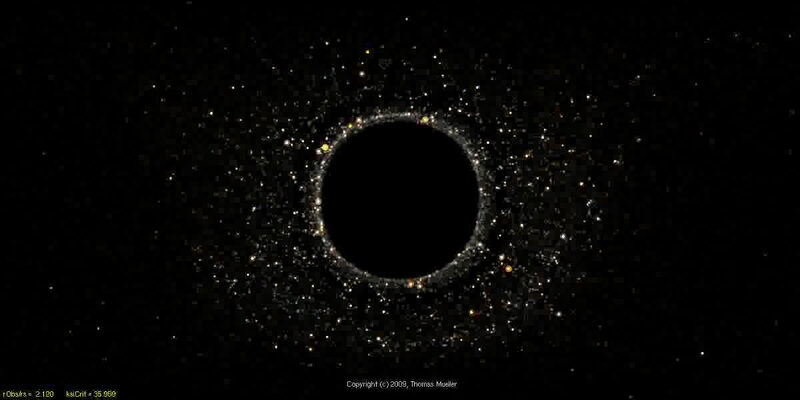 With their simulation of a black hole in space, you can really imagine what it would be like to be in the pull of one. A black hole occurs from the huge gravitational force of an exploding star. The force is so strong and dense that nothing can escape it, not even light. In fact, the enormous gravitational pull of the black hole would seem to displace the surrounding stars, creating dynamic and dramatic changes in, let’s say, a constellation. This effect is explained by the Schwarzchild black hole. The Müller/Weiskopf simulation, detailed in the February 2010 issue of the American Journal of Physics, shows what happens to stars as they approach the black hole. In the video below, you can see the large stars of the constellation Orion seemingly split into two, mirror images of each other on opposite sides of the black hole. As you look into the dark boundary of the hole, or the event horizon, you can see that the stars change colors, appearing redder, as the energy is sapped out of the star’s photons passing near the event horizon. But if you freefall towards the black hole, which the simulator allows you to do, the stars turn bluer due to the Doppler effect. Once in the center of the black hole, there is just the sight of a dazzlingly bright ring that appears to be circling the universe. The Müller/Weiskopf simulation program obtained its data from about 118,000 stars mapped by the European Space Agency's Hipparcos satellite. Once you download the program, you can see the effects of a Schwarzchild black hole on any constellation or grouping of stars you like. But keep your CDs far away from your computer screen. In fact, the enormous gravitational pull of the black hole would seem to displace the surrounding stars, creating dynamic and dramatic changes in, let’s say, a constellation. Bad wording, so let's clarify. The black hole has no more gravity overall, than the star that created it. In fact, it has less, since only a fraction of the star's mass prior to the supernova explosion ends up in the black hole. It does strongly bend light that passes near its event horizon, distorting an observer's view of the constellations behind or near it. Once in the center of the black hole, there is just the sight of a dazzlingly bright ring that appears to be circling the universe. That's not the center yet; that's a bit prior to passing through the event horizon, at a distance where light is able to "orbit" the hole. Past the event horizon, you'd see nothing at all if you keep looking toward the singularity. I didn't really like the jokey start to this article either. I realise this isn't a hard-science periodical, but the slide towards journo-science here is apalling. A black hole occurs from the huge gravitational force of an exploding star. 2) How can a black hole have a half-life, if time stops within it? 2. Black hole evaporation as theorised by Stephen Hawking. A virtual pair is created from nothing out of the chaos, as they do all the time, one of them passes the event horizon and can't then join it's anti-particle, whcih shoots off into space. By conservation of energy, the black hole loses energy (and mass) in this reaction and this is observed as 'Hawking radiation' (proven by observation, I believe) coming off the surface of black holes - one half of a virtual pair. No, it is not observed; just theorized. 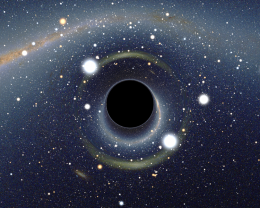 It's impossible to observe Hawking radiation in practice, because for all but the most microscopic black holes it is very weak, and easily hidden by both background noise and the radiation emitted by matter (even if it's only the interstellar medium) still accreting onto the black hole.